Volume I of the complete works of Chiara Magdalena Cozzolani contains all the works in her 1650 publication Salmi a Otto Voci. The double CD set includes texts and English translations, liner notes by Robert Kendrick and album artwork by Nika Korniyenko. 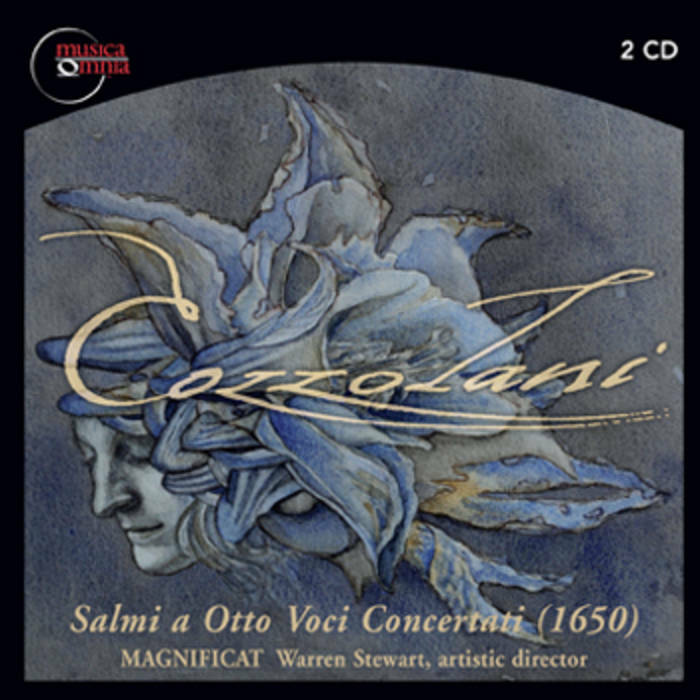 Includes unlimited streaming of Salmi a Otto Voci (1650) via the free Bandcamp app, plus high-quality download in MP3, FLAC and more. Cozzolani's dialogue motet O caeli Cives is available for immediate download in your choice of 320k mp3, FLAC, or just about any other format you could possibly desire. Pre-order the two volume complete works of Cozzolani at cozzolani.com/subscribe and receive free digital downloads of all tracks - those currently available and new tracks as they become available. Please visit cozzolani.com for more information about Cozzolani and these recordings. To conclude her 1650 collection Salmi a Otto Voci, Cozzolani chose the five-voice dialogue for St Catherine of Alexandria, O caeli cives (1650). As in a few other pieces, the 'singing angels' (here, three high voices), to whom musical nuns were often compared, form one side of this dialogue, while two low voices represent the faithful on earth. In his seminal work on the music of Milan's convents, Celestial Sirens, Robert Kendrick suggests that O caeli cives may have been originally composed in 1649 for the feast day of her convent's patron saint, Radegund, whose name scans in Latin like Catherine's. Kendrick notes "the poetic conceit of the dialogue, which features humans (two tenors - soprano Jennifer Ellis Kampani and mezzo-sporano Meg Bragle on Magnificat's recording) asking angels (three sopranos - sopranos Catherine Webster and Andrea Fullington and mezzo-soprano Deborah Rentz-Moore on the recording) for the saint's resting-place immediately after her death, was described in Lampugnani's vita of the Frankish queen (Radegund)." The imagery in the text is similar to that in Simone Peterzano's painting The Mystic Marriage of Alexandria with Sts. Radegund and Justina of Padua [ca. 1585], formerly the high alterpiece in the chiesa esteriore of the convent of S. Radegonda, now preserved in S. Maria della Passione in Milan. O cæli cives, O angeli pacis, audite, volate, venite, narrate: ubi pascat, ubi cubet Christi sponsa Catharina? In cælo quiescit et inter sanctos pax illius est. O felix requies, beata sors! Dicite nobis: ubi regnat exaltata coronata Christi sponsa Catharina? In cælo nunc regnat et inter sanctos regnum eius est. O felix regnum, æternum regnum, beata sors! Dicite nobis, angeli Dei: ubi regnat gloriosa triumphat? In cælo triumphat et inter sanctos palma illius est. O felix triumphus, O palma beata, beata sors! Dicite nobis: ubi iubilans gaudet, exultat, lætatur iocunda Catharina? In cælo congaudet, exultat, lætatur, et gaudium eius plenum est. O dulcis risus, O felix gaudium, beata sors! Ergo casta Christi sponsa Catharina in cœlo quiescit? O citizens of heaven, O angels of peace, listen, hurry, come, tell us: where might she dine, where might she rest, Catherine, Christ’s bride? In heaven she rests, and among the saints is her peace. O happy rest, blessed fate! Tell us: where does she rule, exalted, crowned, Catherine, Christ’s bride? In heaven she reigns now, and among the saints is her kingdom. O happy eternal realm, O blessed fate! Tell us, angels of God: where does that glorious queen triumph? In heaven she triumphs, and among the saints is her victory palm. O happy triumph, O blessed palm, blessed fate! Tell us: where, jubilant, does she delight, rejoice, exult, that happy Catherine? In heaven she delights, exults, and rejoices, and her joy is complete. O sweet laughter, happy joy, blessed fate! So does Catherine, Christ’s chaste bride, rest now in heaven? In heaven does she now rule? In heaven does she triumph? In heaven is she joyous?